Ferrari's 458 Italia has a problem. MILAN (Reuters) -- Ferrari said it is recalling more than 1,240 of its 458 Italia supercars to replace an adhesive prone to melting after five reports of fire accidents. Ferrari launched an investigation last month after media reports of fire accidents involving five vehicles in California, Paris, Switzerland, China and one other unnamed location. A company spokesman said the problem was related to an adhesive used in the wheel-arch assemblies that in certain circumstances due to overheating can melt and eventually ignite. As a result, Ferrari, owned by Italy's carmaker Fiat, will be asking the owners of 1,248 cars produced before July 2010 to bring them in to have the glue replaced with mechanical fasteners, the spokesman said. Those owners who had their cars damaged by fire will receive a new model, the spokesman said. 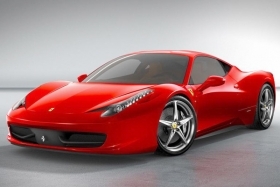 The 458 Italia replaced the F430, Ferrari's best-selling model. In Italy, the 570-hp 4.5-liter V-8 458 Italia starts at 197,000 euros ($253,000). In addition to sending a letter to the 458 Italia owners, Ferrari dealers are calling the customers individually to inform them of the recall. It takes about a half day to repair the problem at a dealership, the company said.